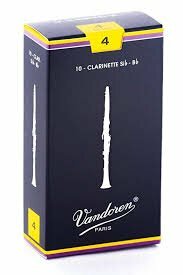 The Vandoren Traditional clarinet reed is perhaps the most popular reed in the professional and educational world. Its reliability and consistent performance has been tested and prroven over many years. These reeds suit all styles of music, all playing environments, and every imaginable type of player..